Once you’ve tried margin you’ll never trade on exchange websites again. Drag-and-drop orders in margin’s beautifully rendered charts or hover over a completed trade to immediately see the gain you just made. RSS feeds are rendered in-chart to allow you to stay on top of the news. 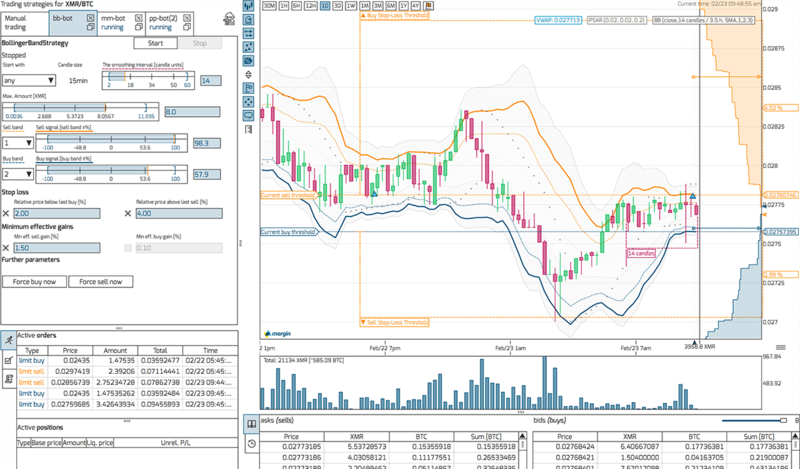 And for power traders it’s possible to view up to 25 markets simultaneously on a second screen. margin allows you to quickly set up automatic trading strategy bots. That means you can make money while you sleep in cryptocurrency markets that never sleep! 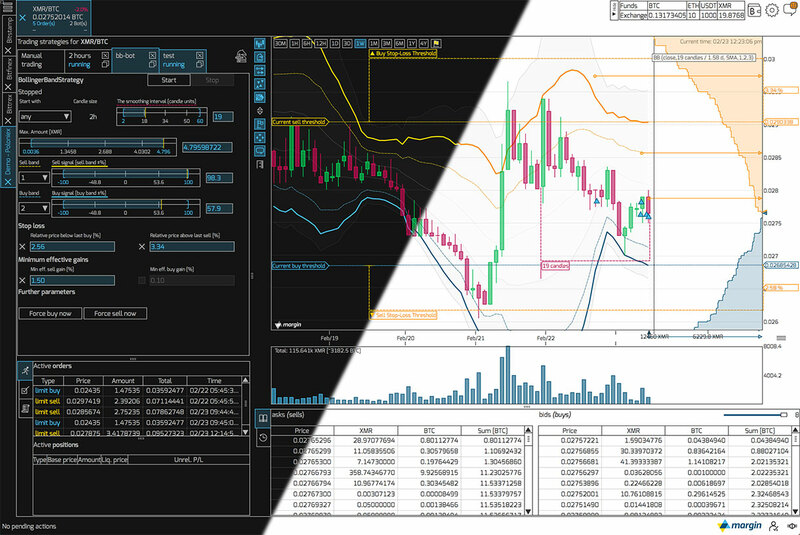 Visualisation of bot parameters foster understanding and allow even beginner traders to take advantage of volatile markets by taking the emotion out of the decision making processes. 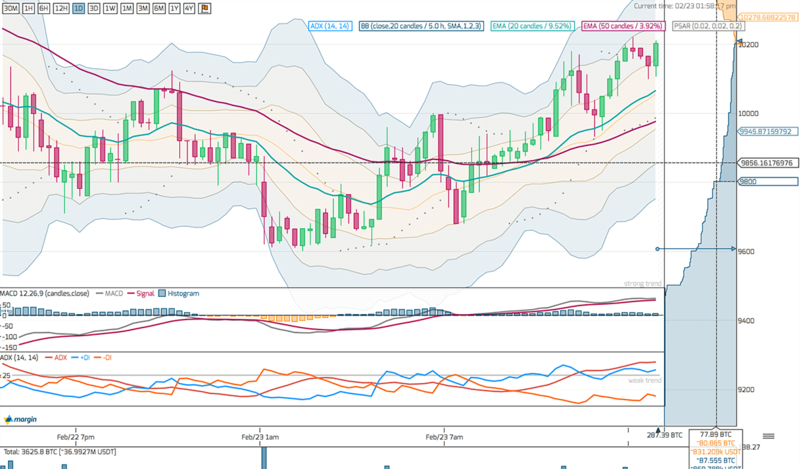 margin ships with a suite of indicators such as Bollinger bands, MACD, RSI, EMA, VWAP and many more. Beautifully rendered, some of them are used as drivers for bot decisions and all can help when you are manually trading. Adding an indicator is just a couple of clicks away. With margin you can configure the GUI to have it just the way you like it! This isn't some website plugin, but a fully fledged desktop application trading terminal. 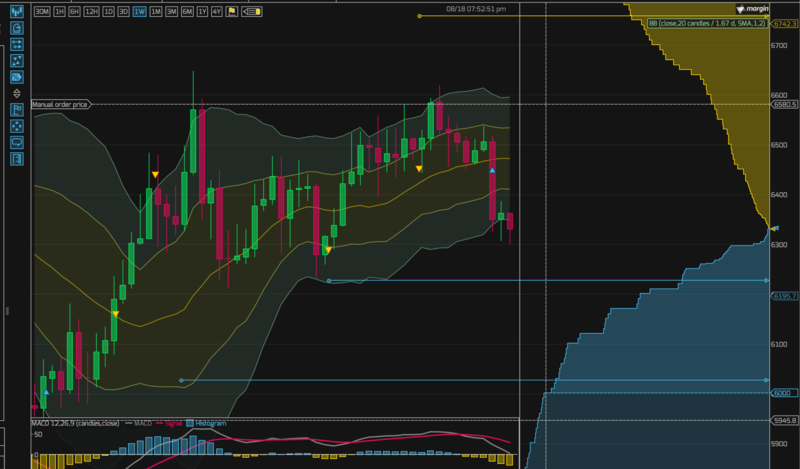 Connect a second monitor to view multiple charts at once, drag-and-drop tool windows to your favoured position and night owls can switch to a dark skin! margin's smart order router is one of our new B2B tools that can split a larger order over multiple exchanges to ensure best price. 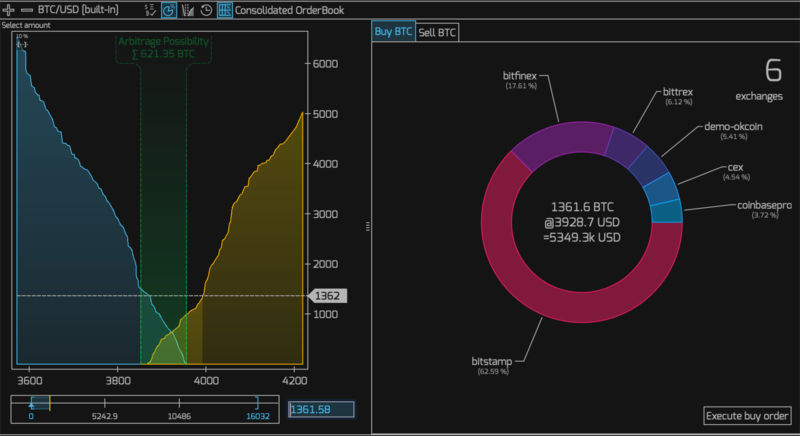 It relies on a sophisticated algorithm that consolidates the orderbooks of each exchange and considers both trading fees and client funds to calculate the split. Click on the B2B link to see a live demo of smart order router and consolidated orderbook. We take security issues very seriously at margin. It’s for this reason that we only store half of a two part API-key pair on our servers - hashed and encrypted of course. We also advise you to not enable withdrawal on your API keys so that it’s impossible for funds to leave the exchange account. Even if our servers became compromised a potential attacker would not be able to do anything with the API info as three quarters of each key pair is not kept by us. Furthermore, margin connects directly to the exchanges and does not route any orders through our servers. We know how important it is to have good customer support in the cryptocurrency space and right from the start we have strived to be the best. Whether you have setup questions, a more involved technical issue or you simply want to suggest new features, we are here to listen and to help you. Click on the chat bubble in the bottom right of the page to talk directly with one of the team and if we can't chat right now we will get back to you by email ASAP. We look forward to hearing from you soon! I just want to say THANK YOU to all the guys/gals at margin for a fantastic product at a very reasonable price! Want to take margin for a spin? Get it now!